Drag and drop page names on the left side of the Page List screen to move pages, forms, and clusters up or down in your navigation menu. 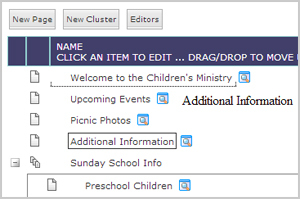 Your pages in a group's navigation will display in the same order that they are listed in the page list area. So, you can drag and drop pages in a group's page list area in order to change the order of pages in a group navigation on the website.